On Saturday afternoon, after a pleasant, high-speed train ride into Narbonne, France, we met up with our traveling party at the small but bustling station. 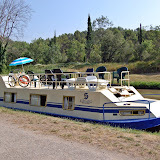 From there we taxied on to Le Somail where our barge was moored, ready and waiting for us. It was hot as blazes, with little shade in sight, but we gamely unpacked our bags in our floating accommodations and did some preliminary food and supply shopping in the only shop in town, charmingly located aboard a permanently moored barge. Back at our boat, the Narbonne, we climbed on deck and listened to Emily explain how we were to operate our vacation vessel, including navigating the many locks we would happen upon on our journey. After the lecture, Bob volunteered for captain duty and we were off! With the exception of the small setback we had on our first full day with a failed alternator that needed replacing, it was smooth sailing, so to speak. Bob, Christopher and Scott made an excellent captain and crew, negotiating the locks like old pros (well, usually) and Caroline and Margaret proved their skill at throwing the ropes up to their mates with impressive precision (i.e. not sloppily tossing the ropes into the murky canal waters). We putted along the waterways at a slow but steady, barge-like pace, enjoying the idyllic scenery along the canal and waving at passing boats and cyclists as is the custom. The sun was hot – at times downright merciless – and the air humid but when the barge was moving, the breeze was positively heavenly. The hours spent cruising the waterways were exactly as Caroline had envisioned and it was a dream come true being out on the water every day for a week. The eight passengers of the Narbonne quickly fell into a pleasant routine, revolving largely around food - preparing, serving and cleaning up after eating (we were in France after all!). Breakfast was typically Scott’s ‘famous’ aero-press coffee and bakery croissants on deck as we set off for the day. 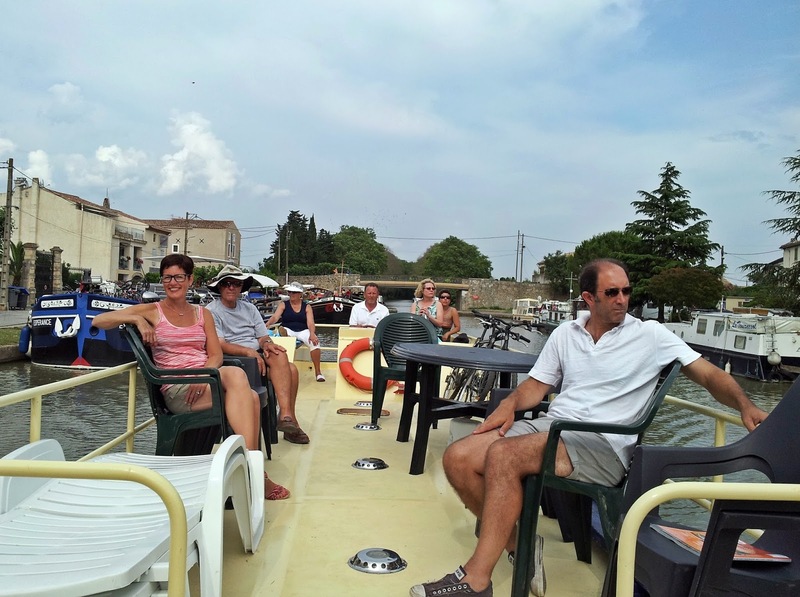 The locks on the Canal du Midi all observe a scheduled closure from 12:30– 1:30 when the lock keepers take their lunch break. As such, we were at the mercy of their schedule, so it made sense to stop for our lunch when they lunched. During the mid-day closure we moored the boat, frequently at a lock while we waited for the lock keeper to return, and enjoyed a leisurely meal on deck. Once we even unloaded the table and chairs and enjoyed our lunch right on the towpath. We dined on a variety of delicious French and Spanish cheeses and charcuteries, including an impressive variety of sausages, some delectable duck rillettes and goose liver pate, in addition to olives, canned fish, boiled eggs, ripe tomatoes, cucumbers and other fruit – all scrumptious. Oh, and of course, we enjoyed plenty of wine with lunch – rose, white or red, take your pick! Prior to the trip, we had thought we would be spending more time off the boat exploring towns and riding the rented bikes on the canal tow paths. As it happened, we typically only moored briefly for lunch and again at the end of the day before heading to town for a group dinner and then back to the boat to sleep. Our one lengthier stop was at the halfway point where we moored in a tight spot in a busy marina (kudos to the captain and crew!) in the city of Carcassonne, dubbed the ‘Jewel of the Midi’ by the tourism board. The only real city on our route, we all went our separate ways to find lunch and explore the old town and the medieval city on the hill for which Carcassonne is known. It was about 95 degrees that day and the touristy medieval city was teeming with visitors. Scott likened it to arriving in the Disneyland of southern France – jewel, indeed! We lasted about 30 minutes before grabbing a couple of overpriced (but delicious!) lemon slushes from a sidewalk vendor and retreating to an unassuming and (un-air conditioned) bar on the town square to sweat in peace. There, Scott delighted in the opportunity to watch the Tour de France on TV in real time (as opposed to at the crack of dawn on the computer at home). Too limp from the heat to even think about shopping for postcards, Caroline enjoyed a mauresque (a refreshing pastis-based drink) or two while trying not to stick to the vinyl seats. 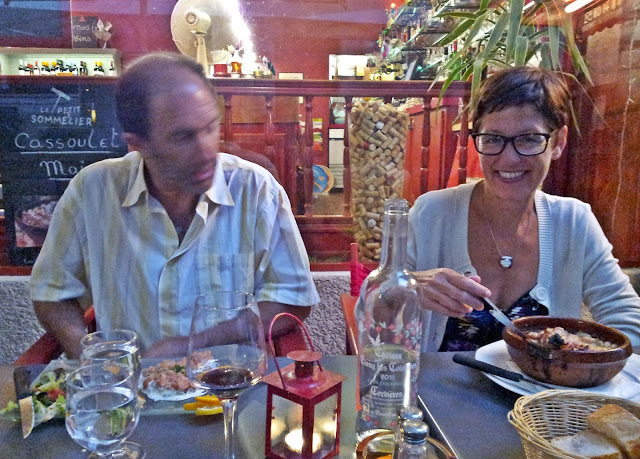 That evening, the heat finally broke after a brief rain shower during which we enjoyed our joint favorite meal of the trip: a truly lovely foie gras followed by an amazing cassoulet, enjoyed al fresco at a charming bistro in town. Oh, and the chocolate mousse for dessert wasn’t half bad either! After another few days of enjoying waking up on the water, watching the scenery go by, lunches on deck, cool afternoon drinks in the heat of the day, al fresco restaurant dinners in the small canal towns and last but not least, the satisfaction of working as a team to make it all happen, it was time to pack up and drop the boat off back where we started.